"Imagine the Earth as a being of sound. The sounds are of all times, its past life mixed with sounds yet to be heard. Now imagine the cosmos as a vibrating living orchestration, with a resonance so complex and deep that we are engulfed by a vast and tender silence." Considered a classic in its genre, Planetary Unfolding was performed entirely on the mighty Serge Synthesizer. From the opening movement "In the Beginning..." we are transported to the far reaches of deep space. Fans of deep space music shouldn't miss out on the immerse journey into the depths of the cosmos which is presented on the state-of-the-art "Planetary Unfolding". The album was originally released in 1981 on lp on the Continuum Montage label. Composed completely on the Serge synthesizer (built by Michael’s friend Kevin Braheny), the six tracks are a feast of thick layered modular synthesizer chords which easily visualize the expansiveness and haunting beauty of space. Goosebumps and shivers are guaranteed as the intense, immerse and massive sound washes of this classic space music present themselves in all their shining beauty as we head further and further into infinite space. "Planetary Unfolding" is an absolute must-have, although very tough to find since a long time. Bert Strolenberg / Sonic Immersion This album is/was incredible. The sense of expansive space permeates every song. It is am amazing piece of work. Unknown reviewer Back in 1986 I heard the first part of this CD playing over the radio, It took me over 7 years to find out who this was, I wore out the cassette copy I made back then. Planetary Unfolding is my favorite from all Michael Stearns Work, that took a lot of time and effort into the making of this Hauntingly Beautiful release, Takes you out of the past into this present knowing there is a future, When you listen to this CD I guarantee that you will be on another planet before it's done. 2007. Mike Costa / USA On occasion, you find a recording that truly is ground-breaking. Stearns' Planetary Unfolding is such a recording. Why this album is no longer available is a mystery to me. Michael's ability to alter the consciousness of the listener is un-matched by anyone I have ever heard. Perhaps some of the Aphex Twin's ambient recordings or Robert Rich at his best would be a close second. If you can find this recording, buy it ASAP. A classic, especially considering it was recorded in the mid 1980's. 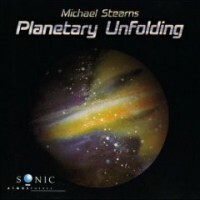 Other Stearns' recordings are good, but nothing compares to Planetary Unfolding in my view. Robert T. Schaefer A masterful electronic symphony, it is based on the idea that the universe is made of sound rather than solid matter (a notion that has its roots in oriental philosophy as well as in some modern theoretical physics circles). Stearns's performances on the Serge synthesizer actually give the feeling that atoms, cells, planets, and other celestial bodies are creating a complex orchestration that is unfolding on itself.